A comedy about the trip home from hell, Planes, Trains And Automobiles finds writer and director John Hughes graduating from teenagers to adults, and maintaining his clever ability to mix humour with humanity. It's two days before Thanksgiving, and marketing executive Neal Page (Steve Martin), in New York for a meeting, just wants to hop on a plane and get home to Chicago where his wife Susan (Laila Robins) is waiting patiently. 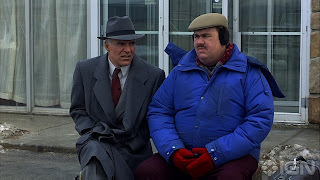 Neal is a relatively quiet and introverted man, and his trip starts off badly when his attempts to hail a cab are unintentionally thwarted by shower curtain ring salesman Del Griffith (John Candy). Neal finally makes it to the airport only to find his flight delayed, then he finds himself squished into the middle seat next to Del, who is a boorish, talkative bore. With bad weather over Chicago, the plane is diverted to Wichita and the two men find themselves sharing the same motel room. Neal discovers Del to be a disgusting slob, but also an honest, resourceful and somewhat lonely man. With most flights grounded, Del arranges for the two men to travel by train, and momentarily Neal starts to believe that things are looking up. But then the train breaks down in the middle of nowhere, Neal and Del are thrust back together again, still a long way from Chicago. After having made his name directing a series of teenage-oriented comedies renowned for treating young adults as real people, Hughes fully graduates to grown-ups, and loses none of his magic. Planes, Trains And Automobiles exaggerates to good effect, but is otherwise a comedy propelled by a story familiar to all travelers: the seemingly innocuous flight that turns into an ordeal. At an efficient 92 minutes, the film keeps the laughs coming at a steady pace, and uses side characters, including a car rental desk clerk and a local Wichita pick-up driver, to inject big laughs at regular intervals. At the heart of the story Neal and Del interact like rotating magnets, alternating between being pulled together through circumstance and then pushing away due to abject incompatibility. Just when it seems the two men cannot survive a minute more in each other's company, Hughes expertly pulls out the pathos card and reveals the humans behind the comic masks, drawing the two men back together out of compassion or sympathy. 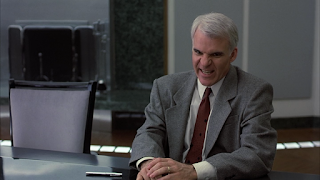 Hughes deploys Del's character extremes to maximum comic effect, turning the stereotypical salesman into the worst possible nightmare travel companion. Del has stinky feet, turns the bathroom into a mess, explodes beer cans all over the bed and makes animalistic noises before falling asleep. He also has the uncanny ability to make any situation worse, and to actively tempt residual bad luck just when good luck appears to get a foothold. If the film has a weakness it resides in Hughes carrying Del to an extreme; he too frequently steps over into caricature territory. It would take the worst possible confluence of ill-timed and unfortunate events for the domesticated Neal to tolerate Del, and in the context of what should be a short flight from Chicago to New York, unfortunate events are all that Neal will get. Cab competitions, delayed flights, seat booking mess-ups, foul weather, a taxi literally from hell, bad motels, horror car rental companies and failing trains. If it can wrong, it will on this trip. Steve Martin and John Candy reach career highlights under Hughes' guidance. Martin perfects his ordinary but combustible man facing intolerable chaos, and Candy steps out from the sidekick shadows to share centre stage, allowing Del Griffith to be chief comedy maker but never losing sight of the solitude at the heart of living on the road. The film moves towards revealing the true nature of Thanksgiving, as one way or another Neal and Del are forced to look past their incompatible exteriors to finally confront the person within. 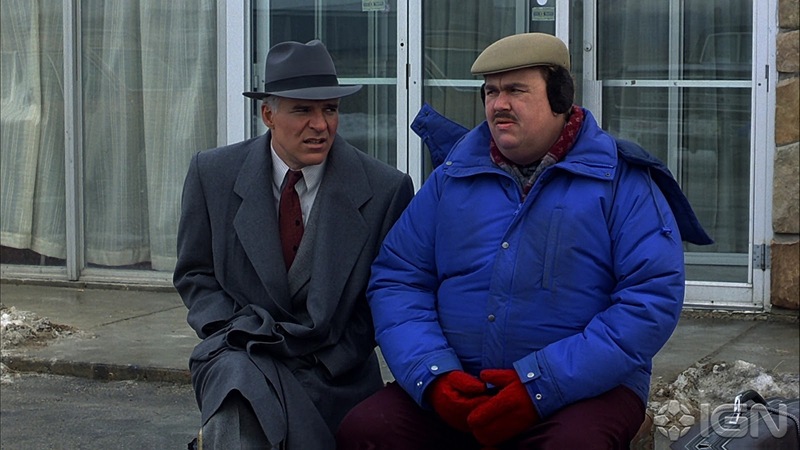 Planes, Trains, And Automobiles features plenty of transportation modes failing to deliver, but is ultimately about the people inside the machines reaching true destinations.